Evelyne Boren (a native of Munich, Germany) enjoys worldwide recognition for her impressionistic art interpretations of life, people and scenes of the Southwest, Mexico and Europe in watercolor and oil paintings. Evelyne’s life reads like an adventure story—from the time she attended school in Switzerland and England, to her move to the United States in 1958 and her stunt work in movies. Before beginning her full-time professional career as an artist, Evelyne had an aquatic career that included underwater stunt doubling in the James Bond films “Thunderball” and “You Only Live Twice”. She was the first woman in the world to swim with a killer whale in the movie “Namu the Killer Whale”. She appeared on the television programs “What’s My Line” and “To Tell The Truth”, where no one guessed her profession. She also appeared frequently in the television series “Sea Hunt”, “Aquanauts” and “Flipper” where she helped train the star dolphin. From these adventures she turned to painting in 1962, while on location filming in the Bahamas. The breathtaking color and beauty of the islands stirred a deep desire within Evelyne to express her feelings on canvas, so she began to paint. Her enthu-siasm, drive and discipline have resulted in a very successful art career. Evelyne has studied with several important artists, but has developed a style that is strictly her own. In 1990, in Roussillon, France she entered a competition for paintings that used only burnt sienna, raw sienna and yellow ocher pigments that are mined locally. The only foreigner, she won first prize over forty other French artists. In 1997, Evelyne had the honor of having one of her paintings selected for the official Santa Fe Opera Poster. 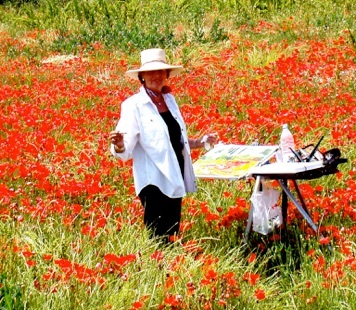 She has more then 4,000 original paintings in private and corporate collections around the world. Evelyne maintains a permanent studio in Santa Fe, New México and in Sayulita, México. Studied in Munich Germany to 1955. 1956 French Diploma, Ecole Ruegg, Lausanne, Switzerland. 1957 Cambridge English Language Diploma, England. 1963 to 1970 Studied Watercolor with Robert E. Wood and Tom Hill.